ACCESS prides itself in serving the entire metro Detroit community. Programs offered through the Employment & Training Department are designed to help people of all ethnicities. The Employment and Training Department at ACCESS is a certified Michigan Works One-Stop Employment Services Center. Its mission is to assist in matching people with jobs, and empowering individuals by providing them with the skills and resources necessary to eliminate any dependency or impediment to self-sufficiency. 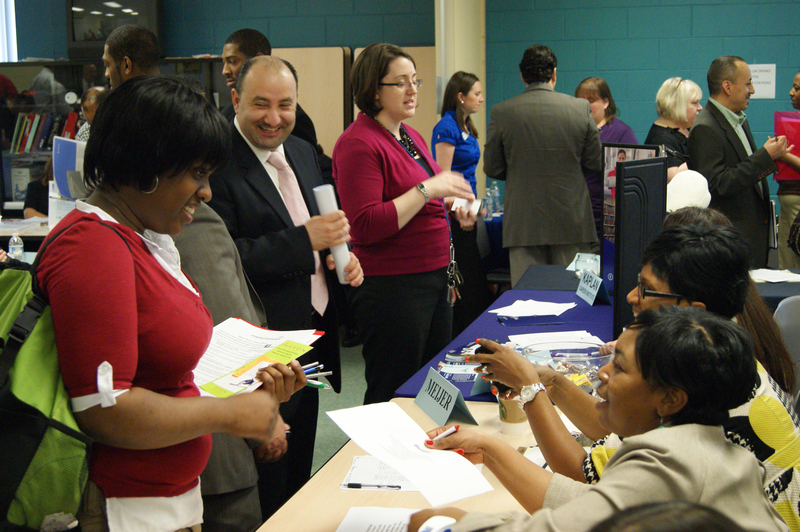 In 2013, the Employment and Training Department connected 2,094 people with jobs, and 620 clients with paid skills training.These job seekers reside throughout metro Detroit, and represent diverse ethnic and racial communities. Information on adult education, financial aid, job training, etc. The purpose of the Workforce Innovation Opportunity ACT (WIOA) of 1998 is to provide services—such as intensive counseling, career preparation, test assessment, training, job development and placement—to eligible adults and dislocated workers. The goal of these services is to promote high quality employment, job retention, increase earnings, and provide educational/occupational skills improvement. The client’s first step is Core Services. Core Services are self-directed activities that are customer-driven and include activities such as: creating resumes or cover letters, searching and applying for jobs, attending job fairs, or seeking information on and applying for other needed programs at the center. If a client is unable to successfully find a job through Core Services, a WIOA career specialist will be assigned to help the client plan for and participate in a combination of activities leading to employment. More details on the WIA program and requirements is addressed during orientation and a one–on-one counseling session. Adult customers must meet the income guideline determined by the Lower Living Standard Income Level (LLSIL) Guidelines. WIOA Youth programs assist young adults to become effective leaders in the community. The programs aim to remove barriers that may prohibit youths from achieving their social, academic and professional goals. Leadership development opportunities: Youth can participate in leadership conferences and volunteer community service opportunities. Youth between the ages of 16 and 21 who are considered low income, deficient in basic literacy skills, high school drop-out, homeless or runaway, foster child, criminal offender, or any individual who requires additional assistance because of a disability. Partnership Accountability Hope Training (PATH) is part of the Temporary Assistance for Needy Families’ (TANF) program. The Department of Human Services refers clients to this program, which is designed to help welfare recipients establish and maintain connection to the labor market. PATH is a curriculum-based program that provides case management and career counseling, employability skills, training, supportive services, and self-directed job search assistance. The program offers a supportive environment and prepares participants to apply for work and assists them in finding meaningful employment. ACCESS works with Detroit Employment Solutions Corporation (DESC) and Southeast Michigan Community Alliance (SEMCA) region programs to fund its welfare program. Program participants must be TANF recipients in Wayne County, including the city of Detroit; and must have been referred by the Michigan Department of Human Services. Services are available to limited English proficient clients from across Wayne County. This program connects refugees to the Temporary Assistance for Needy Families (TANF) program through the Michigan Department of Human Services (DHS). Counseling and support is provided, along with employability skills, English as a Second Language (ESL) classes, acculturation, workplace English, and other sources to help refugees find and retain employment. Participants must be enrolled in the PATH program. The Employment Services Program assists individuals seeking help filing for unemployment benefits. Unemployed men and women have access to the library for self-directed searches of career-related information, business directories, online resources, job postings and other tools. Also, the self-directed resource room offers employability skills training, resume writing, testing and assessment services. Job seekers and employers gain access to Michigan’s Talent Connect, an online-based labor exchange system accessed at Pure Michigan’s website, www.mitalent.org. Individuals seeking employment can upload their resumes for prospective employers. Eligibility is open to all job seekers. To claim benefits, staff in the Self-Directed Resource Room can assist or guide job seekers who are filing for unemployment insurance benefits. All job seekers must submit their resume through Pure Michigan Talent connect at www.mitalent.org to satisfy the work requirement to claim their benefits. Eligibility is open to all benefit claimant/applicants. Other training services cover basic computer skills, English as a Second Language (ESL), and GED preparation. These training services, offered on an individual basis, are customized to meet the needs of each student. Students have the opportunity to learn at their own pace in a supportive environment. A veteran’s representative/counselor is available to assist veterans seeking employment in the ACCESS Learning Lab. Services include specialized counseling, resume writing, job information and referrals. Any veteran of the armed services is eligible to receive assistance. For individuals with disabilities that require workplace accommodations, Michigan Rehabilitation Services assists in evaluating, training and supporting persons to become productive employees. Individuals with disabilities who are seeking employment can apply for assistance. Job seekers who have been denied work or fired because of nationality, appearance, or accent have the right to file a charge of discrimination with OSC. The United States Department of Justice will investigate discrimination claims. For information, call 1-800-255-7688, or visit www.justice.gov/crt/osc.